bars | Blog, Jane! Blog! At work in the cafeteria, there are always lots of yummy treats. 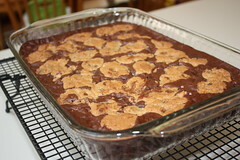 My favorite lately has been a golden grahams smore bar. 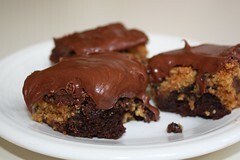 I decided to make them last night for Chad to take to his Poker game. I got to try one and it was good! And he said all the guys raved about them. Grease 13×9 inch pan. Heat syrup, butter and chips to boiling, stirring constantly. Stir in vanilla. Pour over cereal until coated, fold in marshmallows. Press in pan, let sit 1 hour and cut into squares. 1. Lightly spray 13×9″ pan with cooking spray. In a 4-5 qt Dutch oven, heat corn syrup and sugar to boiling over medium-high heat, stirring constantly. Cook until sugar is dissolved; remove from heat. Add 1 cup of the peanut butter; stir until smooth. Add cereal; mix well. Immediately, press in buttered pan. 2. 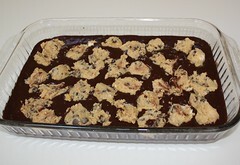 In a 2-qt saucepan over low heat, melt chocolate chips with remaining 1/4 cup peanut butter, stirring constantly. Spread evenly over bars. 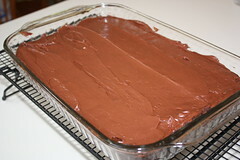 Refrigerate about 30 minutes or cool completely at room temperature until chocolate is set. This is a keeper. 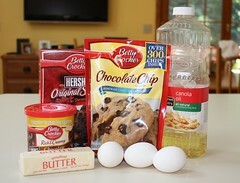 I found this recipe online here. We had brunch after Elizabeth’s baptism, and I thought they’d be a good dessert for brunch since they had oatmeal in the crust. 🙂 Plus it’s always a good time for cheesecake.